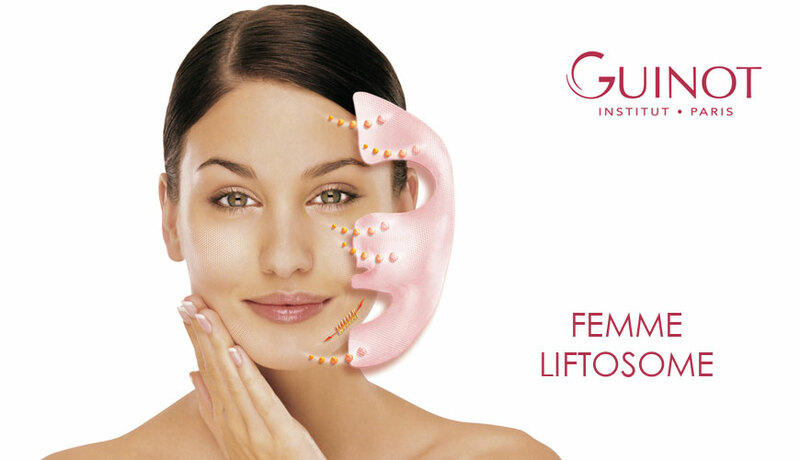 Liftosome is one of the most effective and spectacular Guinot treatments due to its vitamin C and pro-collagen content. It restores your skin's freshness and youthfulness. We gently rub a lifting serum containing pro-collagen and vitamin C into your skin, which enhances cell activity and gives back elasticity. The next step is to put on a thermal mask. Under this thermal mask the ginseng and orange concentrates diffuse, so the lines of your face get smoother. These active agents combined with the warming effect fill up the skin with new energy and regenerate the cells. After the treatment the signs of weariness disappear and the skin becomes radiant. The lifting effect of the ginseng and orange extracts: the ginseng and orange extracts, which can be found in the thermal mask used as a second step of the treatment, regenerate the face skin and soften the lines. Due to their skin smoothing effect you skin rejuvenates in minutes. Chitin for softening your skin: we massage a jelly into your skin, which increases the skin's tautness. Your skin becomes smooth and soft. For a long-lasting effect: a cure of 2 treatments for two weeks, once a week. This cure can be repeated 4-6 times a year.